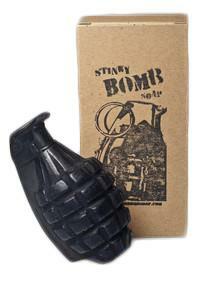 Blast away the dirt with our hand grenade soap. Cast from an actual de-milled WWII steel body Grenade. The grenade was cast in a 2 part silicone mold so it holds all of the detail of the original. Soaps are created from either an aloe & olive oil base for a translucent look or a natural goats milk base giving an opaque finish. BROKEN CHERRY & STINKYBOMB DISCLAIMER: THIS ITEM SHOULD NOT BE TAKEN ON AIRPLANES. DO NOT BUY THIS ITEM AND THEN GIVE IT TO SOMEONE WHO IS ABOUT TO STEP ON A PLANE. DO NOT ASSUME THAT PUTTING IT IN YOUR CHECK IN LUGGAGE WILL ALLOW THE SOAP TO PASS ANY AIRPORT SECURITY SCANNERS.